Brow Shapes is devoted to provide natural beauty services using threading technique. Their beauty experts are very experienced and trained to master a perfect method of holding the thread, placing it and accurately measuring the area to ensure close symmetry in shaping the eyebrow. 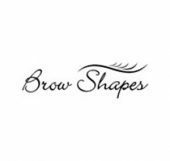 Brow Shapes will make sure that you receive the highest level of quality and customer service. Their beauty experts will do their best to assure you will be so happy with the results that not only you become a valued fan but recommend our services to your friends too.